Schedule: Wednesday 27th August 16:00-16:20. Kleine Veerzaal. 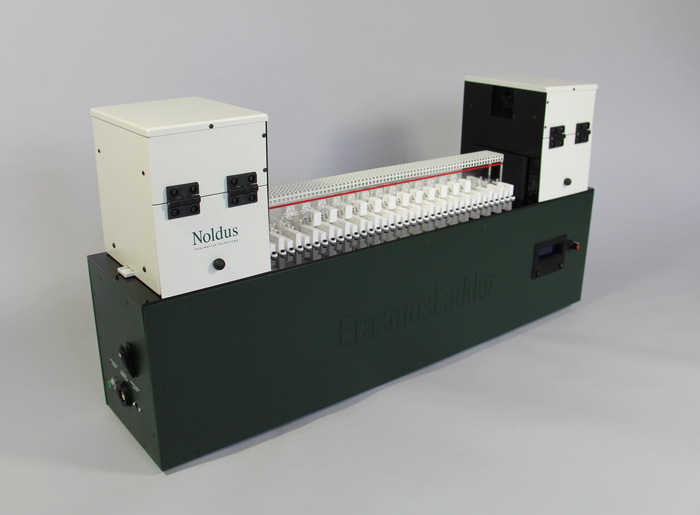 The ErasmusLadder is a new product from Noldus IT that allows researchers to investigate motor performance and reflexive motor learning in mice. The ErasmusLadder is fully automated and requires only basic animal handling skill to operate. The apparatus consist a horizontal ladder in between of two goal boxes. The ladder is made up from touch-sensitive rungs that register the crossing performance of the mice. This crossing performance is measured during a series of 4 sessions in which the animals crosses the ladder 42 times. After these sessions motor performance and motor learning is determined from several parameters. In the next series of 4 sessions reflexive motor learning is assessed by the sudden introduction of an obstacle during the crossings. The appearance of this obstacle is carefully timed and paired with a tone. This pairing allows the animal to deal with the obstacle and after the 4 sessions the reflexive motor learning and performance of the mice is assessed. Since motor learning, reflexive motor learning and the storing of the learned movements are dependent on the cerebellum the ErasmusLadder is highly suitable for cerebellar research in mice.